An audiobook of short stories recalled from a life lived on the edge. 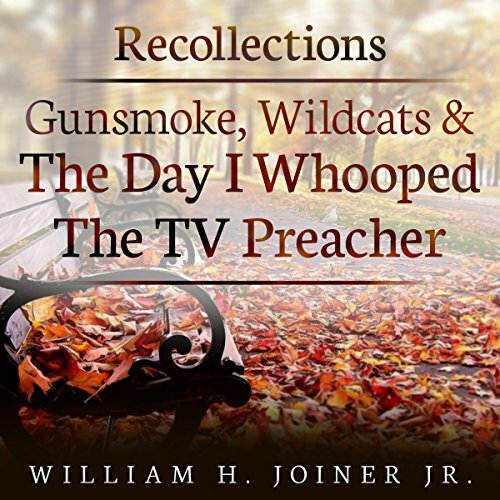 ©2015 William H. Joiner Jr. (P)2015 William H. Joiner Jr.
What did you love best about Recollections: Gunsmoke, Wildcats, and the Day I Whooped the TV Preacher? Narration was a familiar sound.......having grown up in a large family in the Texas panhandle. Would you recommend Recollections: Gunsmoke, Wildcats, and the Day I Whooped the TV Preacher to your friends? Why or why not? Absolutely. A slice of Americana that is slowly fading away. What about Wes Elliott’s performance did you like? It felt like he and I were talking.....no fancy stuff. Very believe able. Joiner and Elliott have a bright future.